The market cap of global equity markets has risen over $40 trillion since the early March, 2009 low, and now stands at a record $66.1 trillion. That's a handsome gain of 158% plus dividends in just over five years. Pessimists argue that this was all fabricated by easy money (e.g., the Fed's multi-trillion dollar expansion of its balance sheet). Optimists like myself argue that these gains were fully justified: At their lows early 2009, equity markets were priced to five years of depression and deflation that would make the Great Depression pale in comparison. As I wrote in November, 2008, corporate credit spreads were priced to the expectation that 24% of all corporate bonds outstanding at the time and 70% of junk bonds would be in default by now. Instead, we've seen a sub-par recovery with growth averaging just over 2% per year for the past five years, record corporate profits, and collapsing corporate default rates. In short, the stock market is way up because the economy has performed far better than expectations. In investing, what matters is how things stack up relative to expectations. Expectations currently are far from exuberant. As I noted yesterday, there are still plenty of signs of risk aversion in the market. Investors are willing to pay a significant premium for the safety to be found in T-bills, TIPS, and gold. Businesses are still very reluctant to invest. The bond market is priced to the expectation that the U.S. economy is likely to slow, and to register growth of only 0-1% in coming years. Since PE ratios currently are only modestly above their long-term average, but corporate profits are at record highs and discount rates are near record lows, the market is (arguably) priced to the expectation that profits will decline meaningfully in coming years. As long as we avoid a recession, it would seem, there is still room on the upside for the equity market. 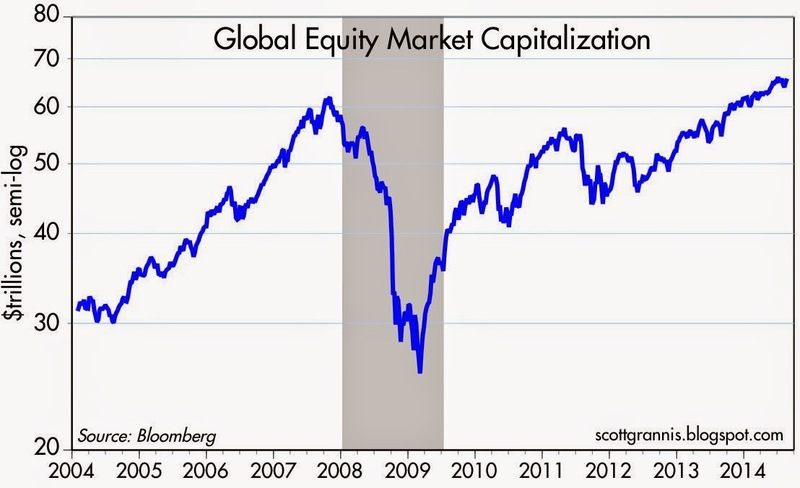 The scary part is that what will push up equities from this point is capital looking for a home. Make sure the PE's do not get too high on stocks that you own.